Discover the activities and entertainments you can take part in at Domaine de Gil and nearby ! At Domaine de Gil, you’ll find activities and entertainment for all tastes and all ages. 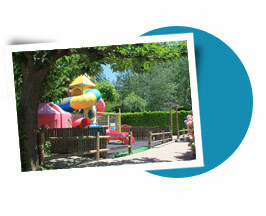 Two playgrounds with slide, spring games… will make the happiness of the children ! Thanks to the structures on the campsite, you’ll have fun ! 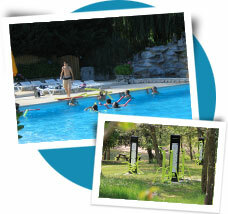 You can also enjoy the sports activities for all age: aqua gym, sports tournaments (tennis, boules, table tennis…). For the rest and quietness of our vacationers, the campsite Domaine de Gil, 4 stars, offer only a few evenings per week, finishing the latest at 11.30pm. Or you children can enjoy the mini discos, specially done for them ! You can also rest on the bank of the river Ardèche, learn how to fish to your children, play boules with friends… or borrow a book at the library. A circus comes at the campsite several times during July and August. You’ll see the animals during the day, and then discover the show at the end of the afternoon (cost a fee). In collaboration with some external specialised partners Domaine de Gil organises hiking tours, discovery circuits on the wild rivers of the Ardèche (canyoning), mountain biking, speleology, canoe tours (Gorges de l’Ardèche), climbing,… Make your reservation at the reception! (Cost a fee). More details on the page « partners ». And discover all the natural beauties of our region ! More information on the page « region ».